Well, I was home on Wednesday. Why? Well, I looked out the window and saw this! 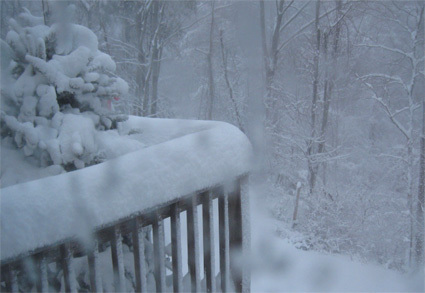 Nor'easter 2011!! What's better to warm up from this mess than with some hot cocoa? 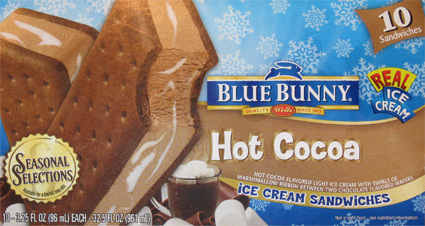 How about (limited edition) Seasonal Selections Blue Bunny Hot Cocoa Ice Cream Sandwiches? Remember I went rogue last time and tried the Christmas Cookie ice cream sandwiches first? Well, I went back before these were gone and used my other free coupon to scoop up these tempting looking treats. HA! Presents and Bunnies! I like it! I can't say I was expecting this to be a messy treat (though it is just on one side). I don't really care, plus that free flowing marshmallow really has me wondering about how good this is gonna be. To be honest, I was not impressed at first. The first several bites were ok, but not great, but I kept eating. Well, about half way through something clicked and I just couldn't get enough. The flavor builds up and locks you in. I literally had my hand on the box deciding if I was going to have a second, but I talked myself out of it and said I could have another one when I got back in from shoveling. two quick notes: When I came back in, I was way too cold to eat another ice cream sandwich (yes, even I have my limits). Second, While the marshmallow may have been pouring out the side, you don't really see it once you start eating it. I'll snag a picture to show you what I mean on the second scoop. 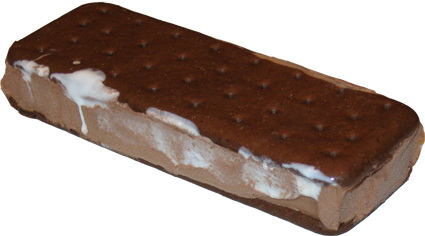 Update: My daughter snagged one of these from the freezer when she got home from school. She took a few bites and then tossed the rest! I don't think she gave it long enough, but yet again I am surprised by what she won't eat. On Second Scoop: I don't know what it is about these treats, but they do start off a bit weird, but it's like you need to go downhill a little bit to build up speed before going back uphill. I still like these, and I still think they finish nice, but I would be lieing if I said they don't start off as strong as they finish. On Third Scoop: Ok, I know this will sound not right, but basically these kind of have a coffee twang to them when you first dig in. It does pass, but it explains why my daughter wasn't interested. OK, that actually looks GOOD to me and I'm not usually wild on chocolate at first glance (I'm more a vanilla/butterscotch person by nature). There have been quite a few recent Blue Bunny treats you've posted about that intrigued me-- wish they had more of a Southern West Coast presence! I love anything with marshmallow. I'll keep am eye out for these.